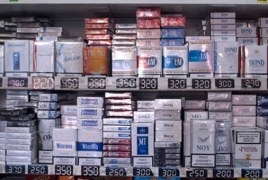 PanARMENIAN.Net - Cigarette packs with new graphic images, warning of the dangers and harmful effects of smoking, will go on sale in all the member countries of the Eurasian Economic Union (EEU) starting from mid-March, the Eurasian Economic Commission said. The EEU is an economic union. A corresponding treaty was signed on May 29, 2014 by the leaders of Belarus, Kazakhstan and Russia, and came into force on January 1, 2015. Treaties aiming for Armenia and Kyrgyzstan's accession to the Eurasian Economic Union were signed on October 9 and December 23, 2014, respectively. "Starting from March 17, 2017, new "scary" pictures will be placed on cigarette packs in the EEU states," the Commission said in a statement. "Manufacturers, importers or sellers have less than three months to put them on packaging in accordance with the requirements of the EEU technical regulations." The Union's technical regulations envisage the application of such images on each pack of cigarettes, or use of factsheets warning about the dangers of smoking. Cigarettes packets will feature pictures of human organs affected by dangerous illnesses caused by smoking, as well as names of diseases from periodontal disease to gangrene and cancer. Ria.ru. С марта в странах ЕврАзЭС будут продавать сигареты с новыми "страшилками"